Michael Goodwin from the New York Daily News had this to say about Clinton's latest comments. Seems that SNL had it right after all. Its over. She's truly gone insane. Hillary has shot her mouth off one time too many. I can't imagine how anyone can think this is an appropriate thing to say in a campaign. Too many leaders have met the fate of an assassins bullet to make these sort of comments lightly. But at least when Huckabee made his comment, he knew when the words left his mouth that he had said something he shouldn't have. He apologized immediately. Ms. Clinton seems incapable of even this level of introspection. The best she could say is that if she'd offended someone, she like to apologize. Hillary, you offended EVERYONE! KT also has a link to a great SNL McCain Ad. Like it or not West Virgina is living down to its Hillbilly stereotype. While Obama has done well with white middle class voters in other states, when West Virginians were asked the reason they didn't vote for Obama, their answer simply came down to the issue of race, not their love of the Clinton's, and not the Wright issue. While it is unquestionably unfair to characterize Hillary as being equated with Hitler, the dialogue seems strangely within character. Here is a link to Hillary's statement to the press. 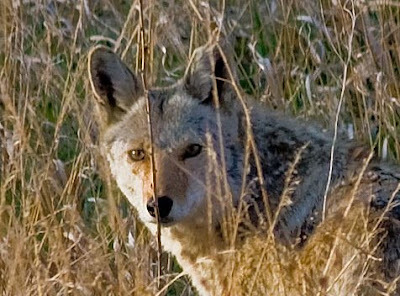 A local blogger Komar has some fantastic images that illustrate an encounter between a pair of farm dogs and a coyote. Kelly has moved with her humans to a new home. This new home has a new enemy. No longer are chasing squirrels her primary concern. Now she goes absolutely crazy over bunnies. She can look out the glass in the front door and see cottontails romping around the neighbor's front yard - its spring after all and rabbits will be rabbits! The sounds that come out of Kelly as she watches this makes one think she's being tortured! Yelps, whimpers, and barks. 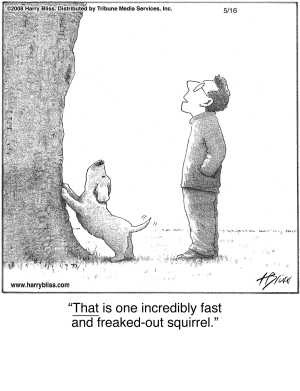 And I suppose in her mind she is being tortured since she can't chase them. Besides being really stupid, leaving a shark hooked to a pole isn't really good for the animal either. Walk up to our new home. As you can see from the video we need to do a little work on our front walk. ;) Well maybe not. Thanks to Dr. Zaius for finding this. How the world works presents some economic excerpts that paint an almost optimistic picture of the economy. Only time will tell if its delusion or foresight. Thanks to Mock Paper Scissors.